It is fascinating, following the craft beer scene, the way that two large, regional craft breweries can simultaneously hit upon the same idea. Purposeful or not, there are times when two new, highly promoted beers arrive in the market and you can’t help but compare one to the other. In the last few weeks, two breweries have popped up again and again in my social networking feeds—San Diego’s Green Flash and Fort Collins’ New Belgium. Both have released new year-round IPAs, which is a significant undertaking for any brewery that already brews multiple IPAs. Moreover, both of their IPAs are infused with a very specific citrus fruit, tangerine, in addition to Citra hops, making the two incredibly similar in their descriptions. It immediately begs for a head-to-head tasting, so that’s what we did. 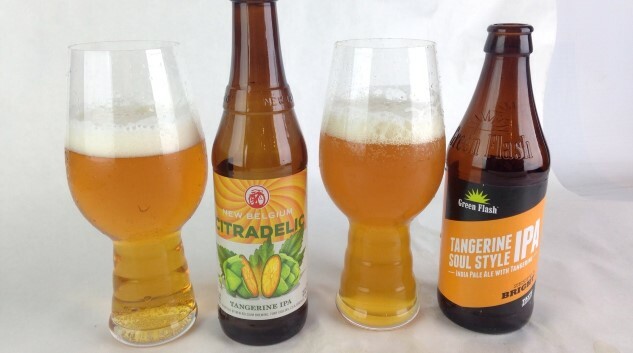 Green Flash (which has an IPA-dominant portfolio already) chose to modify an existing beer, their well-liked Soul Style IPA, with the addition of tangerine. They clearly think the two are now distinct enough to stand alone, given that both are remaining year-round beers throughout 2016. New Belgium, on the other hand, created a new beer from scratch in crafting their Citradelic. Why now? Well, one could certainly argue that there’s more than a little Ballast Point Grapefruit Sculpin in the inspiration. Plenty of IPAs had been made with the addition of actual citrus fruit before that one, but Grapefruit Sculpin explored a new level of what is now hot in IPA—sweet, intense, juicy fruit flavors. That’s what most IPA-centric breweries are now chasing, and it’s easy to see both Green Flash and New Belgium wanting a piece of that pie. But enough background—let’s get to tasting. It’s hard to tell from the photo above, but the Tangerine Soul Style is a touch darker in color, and it’s also somewhat “deeper” in its aromatics. Of the two, it’s a touch sweeter-smelling, with a somewhat more artificial quality that reminds me of orange candy or orange Lifesavers (which I happen to love). There’s a bit more suggestion of malt, with a hint of caramel that modifies the orange into something Dreamsicle-like. Of the two, it’s fuller and a little bit more complex. For straight, piercing impression of citrus, this is the winner of the two. The nose reminds me of fresh-squeezed orange juice—like squeezing an orange peel to release the essential oil. It’s quite light, though, zippy and without any impression of malt at all, backed up by additionally green and resinous hop character. It smells like the more straightforwardly hoppy of the two. Here’s where my impressions began to change. Tangerine Soul Style is definitely the more balanced and complex of these two beers. Biscuity malt makes a nice note, and by and large the beer is dry, with bracing bitterness. Tangerine/orangey citrus is the big hop note of course, but it’s not as sweet as expected from the aroma and is more of a supporting player that holds up the structure of an already tasty IPA without overwhelming anything. Of the two, it’s also the one I would imagine ordering with food, as its drier, more unobtrusive character would fit harmoniously with a variety of dishes. Of the two, I believe I enjoyed the aromatics of Citradelic more, but it didn’t carry over as strongly on the palate. This beer is certainly the sweeter of the two in terms of residual sugars, with juicy fruit flavors that remind me of orange Starburst (which I also enjoy—I like orange candy). It’s less bitter than the Green Flash offering, with little to no balancing malt, which gives it more of an orange soda impression. I wouldn’t be surprised at all if this was the more crowd-pleasing beer in a general tasting of people on the street, given that it’s the sweeter of the two, but over time its flavors began to seem increasingly one-dimensional in comparison. When in doubt, I tip my cap toward complexity, but I could still see Citradelic becoming very popular.